Well it's about time. I would say though (and don't take this the wrong way, I am not trying to steer the market particularly) that £120 for a case seems steep and even inflationary and I would be happier with the around £60 I paid for my Define S (no recommendation implied - it's quality but the market is so strong it's not likely the best option). I have no problems with Fractal I just worry about the ever increasing prices of GPU, Mobo, PSU, Memory etc. It's not good for the people who need access to the interweb the most. Maybe they'll be content with their phone and 4G/5G but I see no reason why the PC Hardware Desktop market should be premium for people in (for example) India or Vietnam. You're getting ahead of yourselves, people, this is a communication and collaboration technology, don't approach it as a luxury good. Sigh, will there ever be a case that will be good enough to replace my high airflow Corsair 450D? This R6 certainly isn't it. In fact, if Corsair just did a 450D refresh in metallic gun metal grey or white I'd buy one tomorrow. Oh dear, completely misses the mark for me as an R4 owner. The R4 is a simple, silent £70ish case. The R6 moves it into the £120+ bracket and takes away some features that made the R series good. I get the feeling they dont know what to do with this model anymore and are trying a new audience. Fractal seem confused with what they want to achieve, they've kept the industrial/office look but want you to put in RGB & watercooling that just doesnt suit the outer asthetics at the expense of useful features, it just seems completely confusing. A big attraction for the R4/R5 was the 8x 3.5" HDD bays. This made it a very suitable case for a home server/workstation at a cracking price. The R5 fixes some R4 issues & adds worthy features, but keeps the foundation that made the R series good. Last edited by AGTDenton; 20-12-2017 at 04:08 PM. If I was to go down that route it would be with a professional, powder coated spray job. A can of spray paint in my hands is a recipe for a disaster. Are the dust filters any good though? I got an XL R2 four years ago, with one of the main attractions being the inclusion of dust filters when other cases didn't still. However, they've been quite the let down due to firstly being naff, and secondly being hard to access - and have since been supplemented with ones of a better quality. I see they have rectified the latter in recent attempts, but what about the former? I've got the R5 and it cost about the same as your R4. For £120 it's still good for what it does (a good silent case) but it's such a massive increase in price it moves it from a strong candidate to one hard to recommend at all. Try to buy this item from Amazon, instead of Scan, as Amazon has a super easy returns policy whereas you'll get stung by a restocking fee from Scan. P.s. Scan... All it takes is to annoy one customer and they NEVER forget. Any idea if Fractal Design will be selling additional 3.5" HDD trays? Cos it looks like you could fit an extra 5 trays in the machine on top of the 6 supplied with it, if you really wanted, which is a really quite nice density of disks. A can of spray paint in my hands is a recipe for a disaster. Couldn't be any less competent a job as Fractal's design and marketing departments could it? Hope they'll sell additional 3.5" drive trays, as it looks like you can fit an additional 5 over the 6 provided with the case. That'd be a nice potential drive density. I like it, it's an impressively modular design. Fitting a 5.25" drive and having the potential to be put together as a hard-drive-tower-less design is a neat party trick (and as far as I can tell you need to got back to january for the last hexus review of a case that took 5.25" drives). Replace the glass with anechoic tile and you should have a very quiet PC. Is it just me, or does it look like you could fit up to 11 3.5" drives, if you could source more of the drive sleds? I don't see the lack of default USB-C as a big issue, because I think a better opportunity is presented instead. The ability to change that front panel with more choices, such as front HDMI for a VR system, a Card Reader etc. All it would need is Fractal to actually make the additional panels. Yup, hopefully they'll be available for sale. Fractal has become decent for making parts available, so I don't see this being unrealistic. 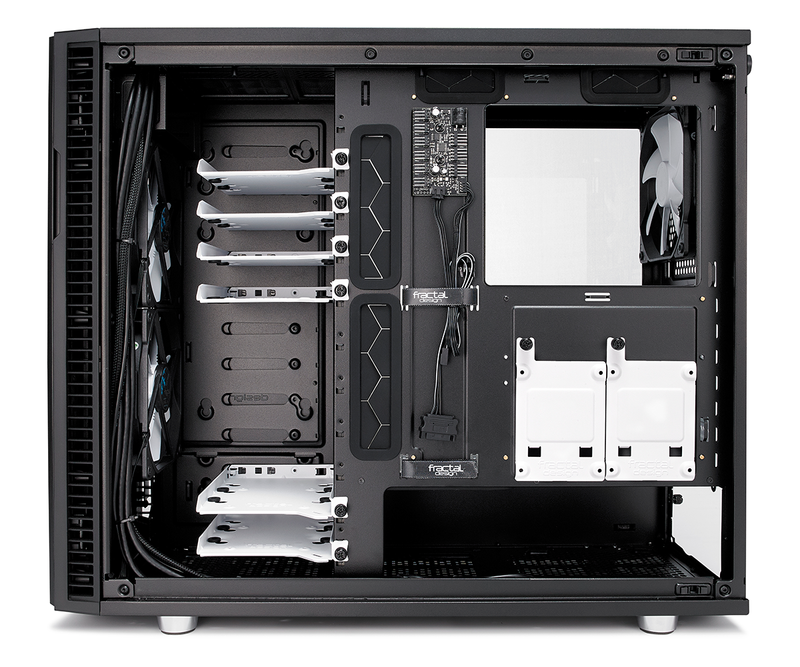 Think if I was paying this much for a case I'd go with phanteks, it just looks less cluttered to me.